*Recent ruminations from LUPEC Boston, as previously published in The Weekly Dig. 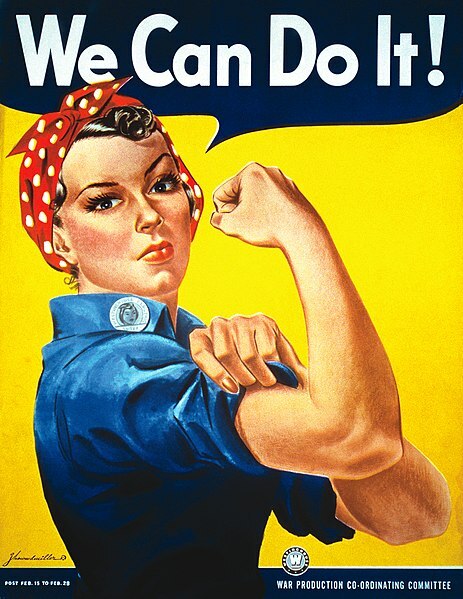 You’ve probably seen those “We Can Do It!” posters often associated with Rosie the Riveter. That bicep-flexing, bandana-wearing dame was a real woman … named Geraldine Doyle. Artist J. Howard Miller modeled his famous poster on a wire service photograph of Doyle snapped while she worked as a temporary metal presser in a defense factory in Inkster, Mich. The poster, originally drafted to discourage absenteeism and strikes at the Westinghouse Electric Company, was displayed there privately for just two weeks … until the image was re-popularized by American feminists in the ’80s. Doyle was neither a riveter nor was she named “Rosie”—the real “Rosie the Riveter” was a cultural icon repping the 6 million women who joined the workforce during World War II. Rosalind Walter, who riveted F4U marine gull-winged fighter airplanes, was the inspiration for the song “Rosie the Riveter,” the first known cultural reference to this iconic figure. The tune was a smash hit when actor Walter Pidgeon stumbled upon another Rosie. While shooting a promotional film about war bonds at the Willow Run Aircraft Factory in Ypsilanti, Mich., Pidgeon met Rose Will Monroe and a real-life Rosie the Riveter was too perfect to pass up. Monroe soon became integral to a federal marketing campaign, appearing in films and posters that encouraged women to work in support of the war effort. Monroe would’ve celebrated her 90th birthday on March 12th. For Women’s History Month, we recommend raising a Rosé the Riveter—created by barstar LeNell Smothers—in her honor, and for all the Rosies who kept industry churning during World War II. *Mix equal parts honey and water for this simple syrup. Do not heat up. Let dissolve naturally. READ MORE ABOUT ROSIE, SMOTHERS AND GREAT COCKTAILS TO RAISE IN THEIR HONOR AT LUPECBOSTON.COM.